As a young boy, Jorge was fascinated by rockets, robots and tall skyscrapers. He like the Jetsons more than the Flintstones, and spent his nights thinking about the future and alternative realities. “What if?” was the question that dominated his mind, as it still does today. Jorge Aguilar combines strategy and creativity to transform organizations and drive profitable growth. 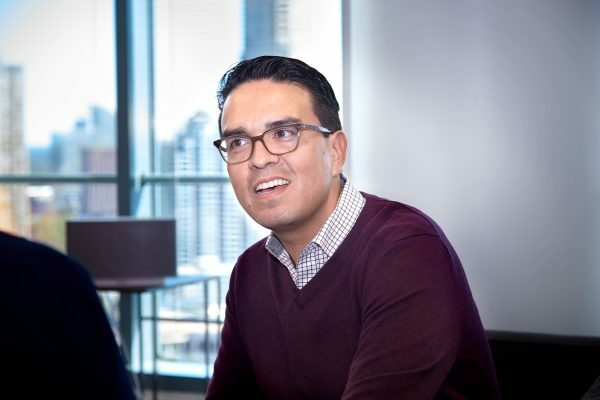 After starting his career as an Associate at Oliver Wyman in Mexico, Jorge’s passion for learning and exploration led him to the United States, and eventually all around the world. 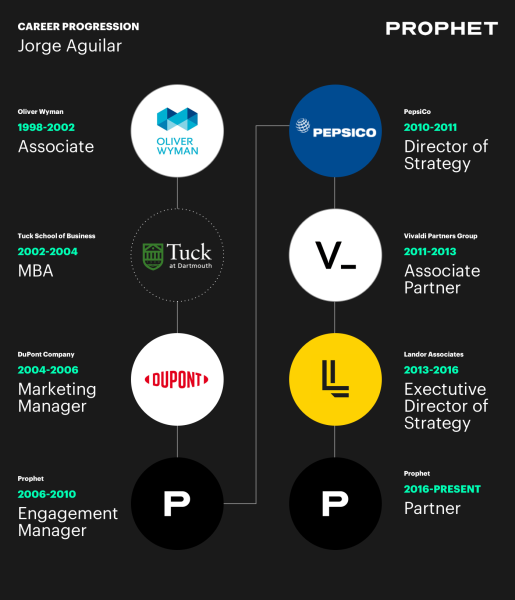 Jorge spent time as a marketing manager at The Dupont Company, where he managed business development for a global brand, and secured partnerships throughout the Asia Pacific region. His next move brought him to Prophet, where he applied his future-forward thinking to engagements with GE Healthcare, Monsanto, and NBC; driving unprecedented growth for the brands over the next five years. When opportunity came knocking, Jorge answered. He left Prophet in 2010 to help PepsiCo develop a strategy that would triple its revenues, enhance innovations in vending/cooling equipment, and win the coffee category by broadening its partnership with Starbucks. He then went on to become a partner at Vivaldi, where he helped Wells Fargo design an enterprise-level rewards program, launched Samsung Mobile’s first retail store and introduced Chilean Olive Oil to the U.S. market. After that, he spent three years as the executive director of strategy for Landor—working with C-level executives to use brand as a platform for action and growth. A mentor and friend once taught Jorge the importance of always pushing forward, while staying connected to his roots. This very well may have been the catalyst for his next move; in 2016, Jorge returned home to Prophet. “Prophet is a special place—an entrepreneurial environment that expects the best of everyone that works here. One of my favorite values is being ’all in’, as it truly exemplifies who we are as a company. The individuals that are successful here are the ones that bring their full self to work, and commit to create meaningful impact for our clients,” He said. His robust career, working on both sides of the desk, with a variety of clients across many industries, has shaped him into the person, employee, and mentor that he is today. An influence early in his career taught him the importance of strong work ethic, passion, and a relentless pursuit of meaningful impact. Jorge passes these same ideals on to Prophet’s junior team members as he guides their own learning and development. In his work, Jorge focuses his energy on defining future states for brands and then finding the best way to get there. He is constantly focused on motion, and strongly believes that staying constant is the kiss of death for a brand. “I am always thinking about how to effectively move organizations forward. While I value and respect the past, I try not to spend too much on it. I spent most of my energy defining the future,” he said. He believes the special sauce for moving organizations forward is personal trust, collaboration, and a multi-disciplinary lens. Outside of work Jorge enjoys cooking, painting, and singing, as well as playing (and winning) at tennis. He has three kids, who he says continue to teach him the importance of being present—you can’t get back time that has been lost. Learn more about Prophet’s incredible leadership team and how they can help your brand succeed.